hat this is Diabetes Bloggers Week. This is rather a big area but the points i think that "need to change" about Diabetes is the use of the term "Diabetes" without a type" and then how its portrayed in the media. Many peo​ple are AWARE that there is more than one type of Diabetes. They are AWARE that people test blood sugars and take shots. 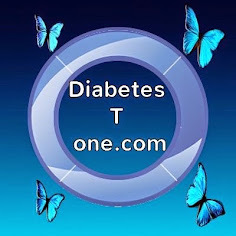 But, even within the medical community, the world at large is rather UNAWARE of Type One Diabetes, what the symptoms are, when to diagnose Type One instead of Type Two, and what to say to us or do for us when we need help or comforting (or even friendship). casual conversation. While Type Two Diabetes is more prevalent, because both diseases are called “Diabetes,” the presumption is that the two are equally manageable if ONLY THE DIABETIC BEHAVED. Living with type 1 or type 2 diabetes is without a doubt challenging, yes for very different reasons​,​ but hold on, do we all face the same challenges in different ways ? No matter what Type we have we will all undoubtedly have what I call "bold days" and yes some "absent moments"
Yes without a doubt we have all made mistakes, some small and some not so small. We beat ourselves up for letting our concentration slip, for loosening our grip and slipping up on our daily management routine. 24/7/365 is no joke and it's not for the faint hearted​, yes we get tired, we are human. Through all this we are constantly at battle with ignorance and yes danger. We can't just ignore when people say, ah yes I know all about that diabetes. y​ou need insulin, right ? You can't have sugar or sweet stuff of any kind, right ? You'll die from that, right ? You'll have to have amputation some day, right ? You must have led a very unhealthy lifestyle, Ye ? That's because your not fit, Ye ? Were you very fat at some point, Ye ? Did you catch that from something ? When I hear someone say these things, it's either ignore them, smile politely and let them remain in ignorance, or correct them, try to inform them of a little something they didn't know. But this brings a risk of disapproval on their part because how dare I correct them even though they were wrong. Making the decision for me is easy, I hear it and the rest is history.Yes people make mistakes and say the wrong thing sometimes but When that statement is blatantly out of whack and comes from someone who says they are a diabetic and has a public platform of millions then letting that statement just coast on​, is not just irresponsible it has the potential to be fatal, our silence can be as bad as the incorrect statement. and is CURED she had come off all insulin. Why haven't the rest of us done this ? Because it's NOT true and NOT possible. GOING LOW AND INJECTING INSULIN ? Be warned, this one can kill you. 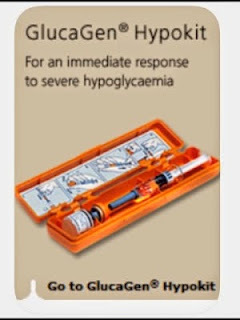 A person with any type of diabetes gone or going low ( it's called a hypo ) needs glucose or sugar. The only injection to take for this is glucagen or glucagon. IF THE INJECTION SAYS INSULIN ON IT "DO NOT INJECT IT" YOU COULD KILL THAT PERSON. ​Every one of us who live with either ​Type 1 or Type 2 Diabetes have a responsibility if speaking about it in the media to portray it correctly or simply refrain from comment. What the general public hear from the media, they believe, sure why would he have said it on national TV if it wasn't correct ? Remember there is always an option to say " I have type 1 or type 2 diabetes and believe me it's no joking matter". Apologises after his blurb gets pointed out. It makes me wonder does that​ person know anything at all about diabetes. NO I don't agree a mistake was made on either occasion, and Yes i know he did'nt go on a TV show to create diabetes awareness, however if he was going to mention it to millions of viewers, he could at least have portrayed it correctly​ instead of pretending to be Mr Big and using it is as some kind of prop. I think he just does'nt know what he's talking about, and is in serious need of diabetes education, but unfortunately now the public has heard him and we will live with the fall out. Being Overweight ( I don't like the word obese ) a person who never eat sugary stuff can still be overweight from eating too much breads, potatoes, pastas, pitza or fatty foods for example, and not getting enough exercise.However that's not the only thing that puts you at risk of be diagnosed with type 2 diabetes. To name just a few. There are very many slim and fit people diagnosed with type 2 diabetes so it's very wrong to label all type 2s as developing it because of being fat or lazy. Sometimes type 2 Diabetes is managed or controlled with diet and exercise. Sometimes it requires oral medications to help them increase their sensitivity to their own insulin which they still produce. This is not oral insulin, as insulin cannot be taken through the stomach. 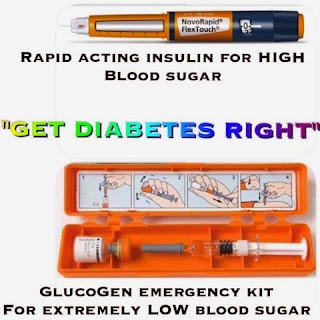 Sometimes they need the help of a long acting insulin injection. ( Basel ). Sometimes they need the help of a short acting insulin with food (Bolus ). Sometimes they need both insulins with their oral medication. There have been some type 2 diabetics who have completely changed their diet and exercise regime and have come off medications. This is not the same as cured, if they slip back to their old lifestyle at any point they would be reunited also with their type 2 diabetes. For all of the above reasons, both type 1s and type 2s have a very serious lifestyle to live, it was said to me recently that some people with diabetes, treat their condition / disease as though it was a "Badge of Courage" and I would agree with that. Those people are either​ very courageous indeed, or very stupid. and you've established they are diabetic, if you think their blood sugar is low, they are unresponsive in any way or unconscious. DO NOT INJECT INSULIN INTO THEM, YOU COULD KILL THEM. Phone for an ambulance straight away. or may not​,​ have this with them. THIS HYPOKIT HAS INSTRUCTION ON THE INSIDE OF THE ORANGE PLASTIC BOX IT COMES IN. DO NOT POUR FLUID INTO THEIR MOUTH, IT WILL JUST END UP ON THEIR LUNGS. Do we react strongly every time we hear diabetes light heartedly discussed ? Yes. Do we react strongly when the wrong information is broadcasted. ? Yes. Do we take it personally ? I sure do because someone will quote what they heard in the media and insist,​ as it was said on national TV then it must be right. Living a life with any type of Diabetes ​is no joke and certainly no laughing matter. We carry around with us everywhere we go, a medication that has the potential to kill if administered incorrectly or indeed if administered at the wrong time. Incorrect information that is broadcast in any form is not only unacceptable but its dangerous.